As a gathering of the newspaper industry’s top brass, IFRA events have often been more relevant for their conferences than for their respective exhibits. The exhibition, or trade fair part with its hands-on workshops, usually has a more or less auxiliary function with regard to the networking, meetings and discussions at these events. Actually, as an organization, IFRA was established as the merger between an international federation of newspaper publishers, the FIEJ, founded after the second world war by survivors of the clandestine press of France and the Netherlands to defend the freedom of the press, and the International Newspaper Colour Association INCA, which emerged in 1961 when European publishers started to use color in newspapers. This combination of press policies and technical issues led to the creation of the INCA FIEJ Research Association or IFRA in 1970, which in 2009 merged with the World Association of Newspapers into WAN-IFRA. 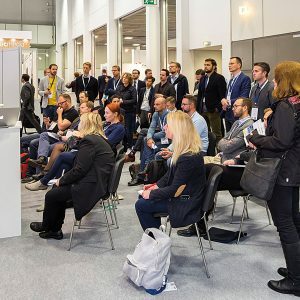 The IFRA World Publishing Expo and the DCX Digital Content Expo, held together for the third time in Berlin this year, have shrunk to a little over 70 exhibitors each, not counting the trade press with close to 50 different magazines and media partners at the Press Pavilion. No Indian exhibitors this time. No other companies based in Asia other than multinationals Fujifilm and Toyo. On the IFRA side, the focus was on mailroom, prepress, printing, business management and distribution systems, technologies, and materials. For the manroland Goss Group, this was their first joint IFRA appearance. Other exhibitors included IFRA die-hards ABB, Agfa, Beil Registersystems, EAE, Ferag, GWS, Honeywell Oy, IST Metz, Koenig & Bauer, Krause-Biagosch, Müller Martini, New ProImage, OneVision, QI Press Controls, Stora Enso, technotrans, Tensor, Tolerans, UPM, Wifag, and some smaller paper manufacturers and software providers mainly from Germany and Scandinavia. DCX covered content services and all kinds of content-related software, from advertising to editorial, with exhibitors such as AdFlow, alfa, Atex, CCI, Ingenta, ppi Media, WoodWing and numerous service companies, a large majority from Germany. A dozen startup companies showcased innovations in automation, digital content processing and retail applications. There has been some interest by Indian newspapers in DCX AdFlow. Indian media are also lately showing interest in voice-casting and voice engagement publishing solutions. The conference program consisted of around twenty panel discussions and sixty presentations and seminars over the three days, with four main keynotes. The first keynote was addressed by WAN-IFRA president and former New York Times editor Michael Golden, who made suggestions for improved storytelling and more accurate journalism. Anu Ahola of UPM spoke about trends and topical issues in newsprint, and Lisa MacLeod, WAN-IFRA vice-president and head of digital content at the Tiso Blackstar, South Africa, presented the digital news media business in South Africa. ABP’s MD and CEO DD Purkayastha provided a snapshot of the changing Indian news media industry. He described the factors that have changed the media landscape in India over the past three years, pointing at the high social media penetration, smartphone content, stagnating readerships and falling ad spend in print, growing viewership and ad spends on OTT platforms, and the challenges posed by Facebook and Google. Next to the many technical seminars and workshops, the panel discussions were for a large part concerned with fake news and the so-called social media. Fake news has become a fad since the current occupant of the White House has made such a fuzz about it, but it is hardly a new phenomenon, nor something from which respected mainstream media would be excluded. In the meantime, an overload of news items is spread through messaging platforms and social networks like Facebook and Twitter, to scattered audiences with little criteria to assess the content’s veracity. Someone in the audience reminded the panelists that the word “social” derives from latin “socii” for “allies”, which originally meant “followers”, and argued that rather un-social networks have become tools of control, and are increasingly being used as platforms for marketing, propaganda, and manipulation. Some of the speakers agreed that the so-called social networks often tend to atomize people and push individualist and egocentric perceptions to the limit, instead of building socially responsible audiences capable of distinguishing fake from real. One journalist saw the cause of this in the intrusion of our daily lives by automated pop-ups, aggressive push advertising in news streams, and ever-changing user interfaces and software applications. She reminded the audience that, in the West, privacy used to be a holy cow, but that people are now confronted with data-mining robots scanning their computers, phones, tablets and game consoles, and that the netiquette of hardly twenty years ago, when advertising or any other than not-for-profit activity on the net was strictly forbidden, has been blown to pieces, so that the audiences targeted by the news industry are completely overtaxed. Another journalist, criticizing the Euronews credo “no statement, no judgement, no argument,” added that the role of the media is to provide tools that help create a critical readership, not just serving up news bits, but by furnishing contexts and interpretations. The next IFRA World Publishing Expo will be held from 8 to 10 October 2019, again in Berlin. IFRA’s next events in India will be the Digital Media India Conference in Mumbai on 21 and 22 February 2019, the South Asia Digital Media Awards campaign running from 1 May to 20 June 2019, and the 27th WAN-IFRA India Conference in New Delhi from 24 to 26 September 2019.